Target Simulator for Optically-Guided Weapons AGM-65 (Maverick), MAU-169 (Paveway), and AGM-114 (Hellfire) | Marvin Test Solutions, Inc. The MTS-916 is a state-of-the-art target simulator for optically-guided weapons such as the AGM-65 and TGM-65 Maverick missiles and guidance sections, MAU-169 Paveway kits, and AGM-114 missiles. Originally designed to replace the obsolete AN/DSM-129 (TV/CCD simulator) and the obsolete AN/DSM-787 (IR simulator), the MTS-916 is fully compatible with any Maverick tester using these legacy simulators. This includes the obsolete AN/DSM-157 (GMTS) as well as the new state-of-the-art MTS-206. Since its initial deployment, the MTS-916 family has been expanded to support testing of MAU-169 Paveway kits (Laser), the AGM-65E/E2, L Maverick, and the AGM-114 Hellfire missile family. Laser variants of the MTS-916 employ an innovative solid-state target design with no moving parts while the TV, CCD, and IR variants employ a moving collimator architecture with precision movement control. The MTS-916 is a modular target simulator supporting TV/CCD, IR and Laser seekers and is available in multiple configurations. 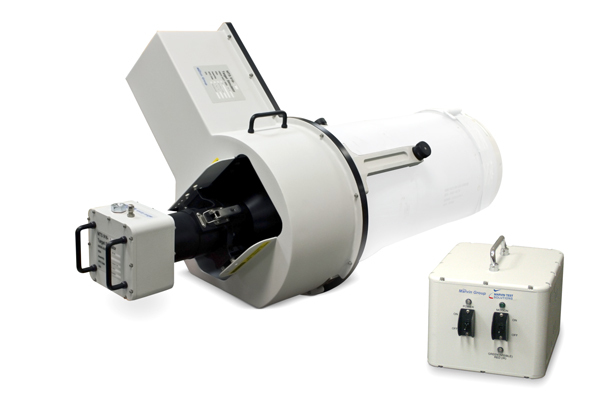 The Optical Unit of the MTS-916 contains the optical apparatus of the target simulator and several different configurations are available. There are three different optical units supporting the seven different MTS-916 configurations. The Mounting Collar is designed to mount on AGM-65 Guidance Sections and can be secured via three quick release screws. The Mounting Collar is compatible with all Optical Units that require a moving collimator. The EU controls the Mounting Collar and the Optical Units and interfaces with the test set (the MTS-206 or the AN/DSM-157). The MTS-916 draws its operating power from the test set and operates in a manual mode to maintain compatibility with the AN/DSM-129 and AN/DSM-787. When used in conjunction with some configurations of the MTS-206, the MTS-916 EU also communicates with the test set and improves the test automation. The EUs used in conjunction with the TV/CCD OU and the IR OU are identical. The MTS-916 was designed to be used in lieu of legacy target simulators such as the AN/DSM-129, the AN/DSM-787, and the SMU-127. Although the design of the MTS-916 may not be 100% Form-Fit-Function compatible with that of the legacy target simulators, it can be successfully used to replace them when used in conjunction with the AN/DSM-157 and the MTS-206. The MTS-916-4, -5, -6, and -7 employ a state-of-the-art, solid-state target design with no moving parts using multiple laser collimators that simulate moving targets. The MTS-916-1, -2, and -3 utilize a moving collimator design with precision control that can be adjusted to control target movement speed and distance.